The Payne Whitney residence designed by McKim, Mead & White c. 1909 at 972 Fifth Avenue in New York City. Whitney was the son of William C. Whitney and younger brother of Harry Payne Whitney. Click HERE to see 'Greentree', Whitney's Long Island estate. 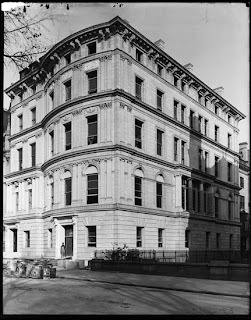 Click HERE for Christopher Gray's Streetscapes article on the Whitney residence and HERE for more. Since 1952 the house has belonged to the French Embassy serving the French Cultural Services. Click HERE to see the Whitney residence on google street view. Photo from the Museum of the City of New York. One has to visit this mansion to gawk at its immense scale. I love the screen on the door I think it was modeled after a cemetery screen in Rome. But interesting picture. I have never seen the side so clearly and the shadow cast on it appears to be from the Henry Cook mansion.